The PlayStation 3 160GB model is now shipping for $299, the same price as the smaller 120GB model released last year around this time. The 160GB PS3 comes with a Cell Broadband Engine, NVIDIA graphics processor, built-in Wi-Fi, 2 USB ports and HDMI (+ Bravia Synch) and weighs just about 7 pounds. Accessories include a Dualshock 3 wireless controller, power cable, USB and AV cables, and free basic Playstation Network membership. 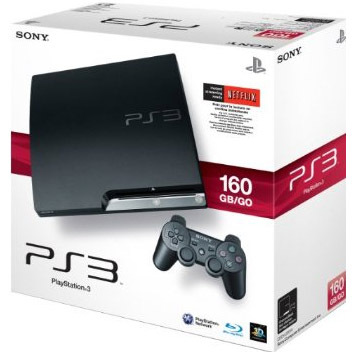 Purchase the PlayStation 3 160 GB now shipping for $299. Sony just announced the release of a 320GB capacity PlayStation 3 which will ship in September. The model will sell as a bundle with Move controller, Eye camera, Sports Champions, and game demo disc for $399.